Yesterday, the frontrunner Toronto Blue Jays stumbled against the underdog Texas Rangers, while the Houston Astros kept on rolling against the Kansas City Royals. Today, the Houston Astros are my World Series favorites. 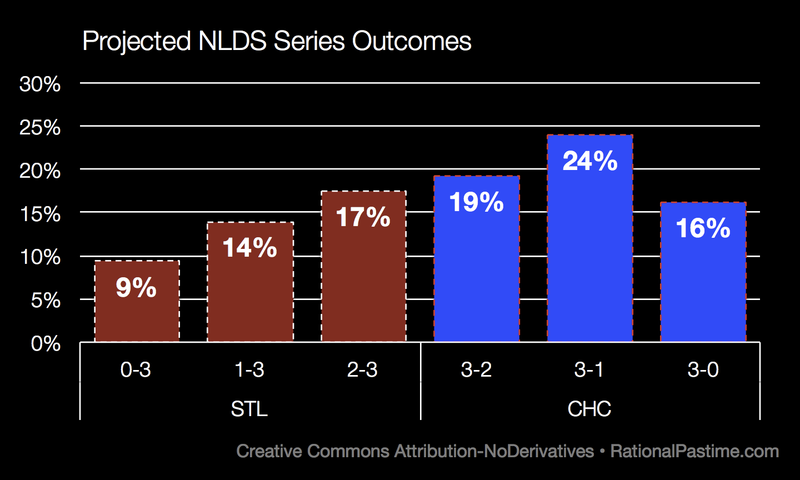 Meanwhile, National League play begins today with the Cubs as Senior Circuit favorites at 5:1. 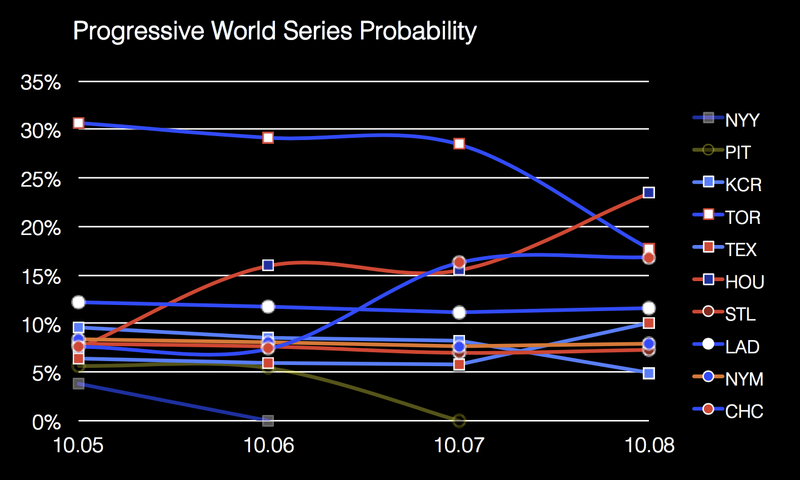 Despite their setback, the Blue Jays are still the second most likely World Series champion at 18%. Though the Cubs begin their series against the St. Louis Cardinals with the lesser record and without home field advantage, my RPScore system believes Chicago's superior talent will be enough to take down the Redbirds. 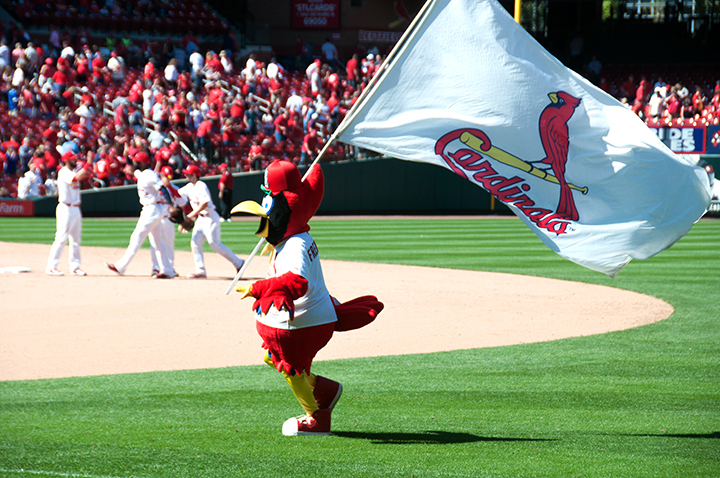 The playoff simulator's modal expectation in this series is a Cubs win in four, while the Cardinals' best hope is to force a fifth game at home. 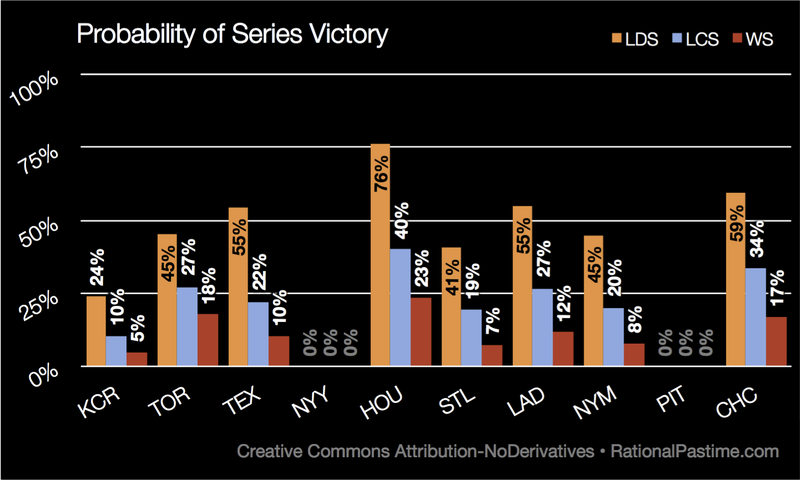 In the 2-3 NLDS match-up, the Los Angeles Dodgers and New York Metropolitans come in as near-equals, with the former enjoying better odds thanks to home field advantage. 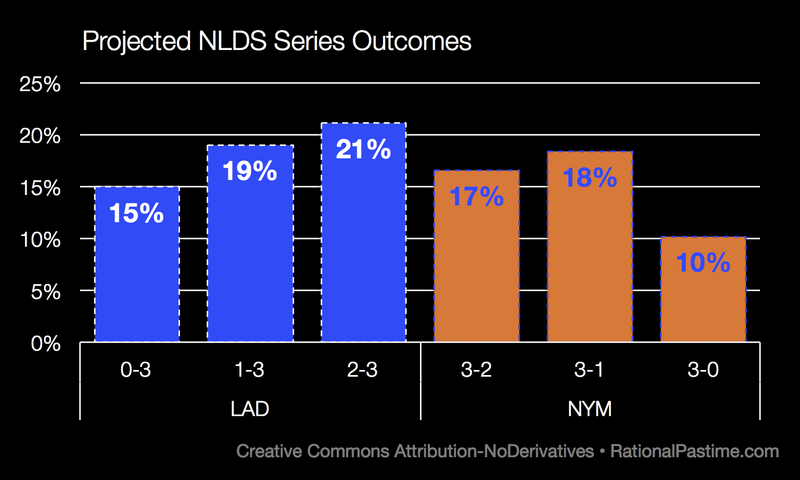 The playoff sim's modal outcome is a Dodgers game-five win at home in Chavez Ravine; the Mets' best shot is to win the series in four games. Thanks to their game-one win, the Houston Astros are now near-prohibitive favorites against the top-seed Kansas City Royals. The playoff simulator now expects a Houston sweep, followed closely by an Astros win in four. The Royals' best hope is still to force a fifth game at home. Having defeated the Toronto Blue Jays in the first game, the Rangers are now slim 55-45 favorites to advance to the ALCS. 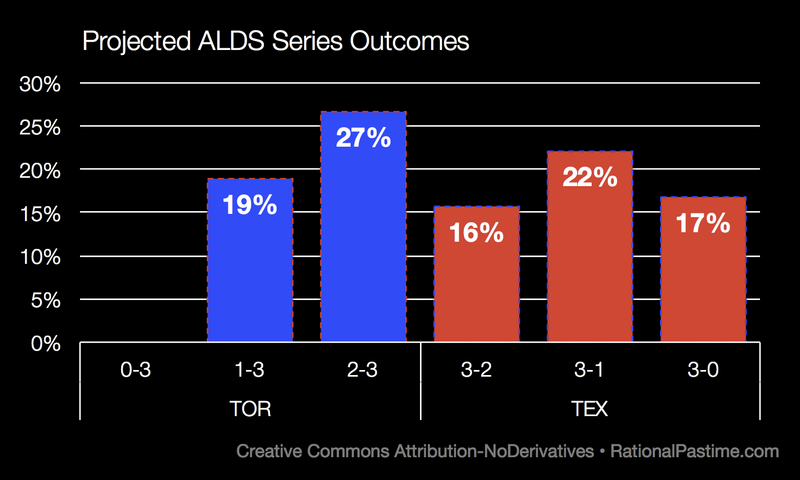 However, the playoff simulator still finds that the most likely single outcome is a Blue Jays victory in five. The Rangers' best chances come in a victory in Arlington in game four. Houston and Chicago have taken over the World Series result leaderboard, with the most likely outcome now an Astros win over the Cubs in seven games; Chicago's best hopes lie in beating Houston in six. Toronto remains on the leaderboard, topping out at the eight spot, with a 1.8% chance of their beating Chicago in six games. 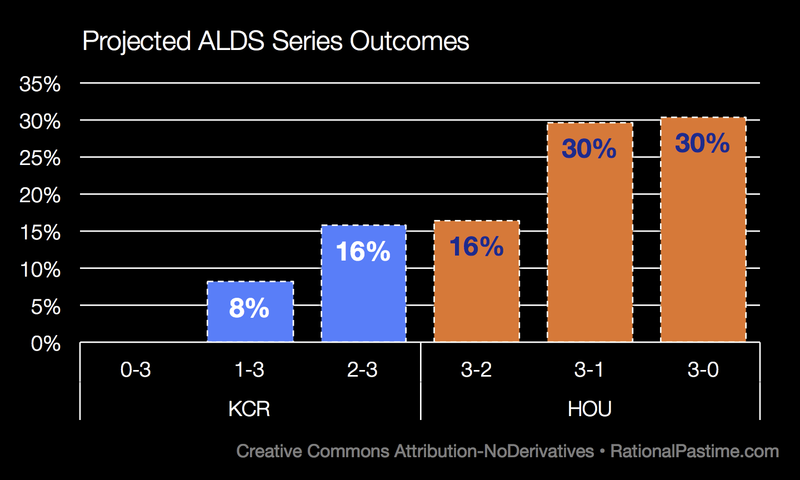 Victories by the two Lone Star State franchises boosted the odds of an all-Texas ALCS to 42%, while the odds of an all-Missouri World Series dropped to 2%. Stay tuned to find out how the first full day of 2015 playoff baseball affects each team's chances of taking home the Commissioner's Trophy.